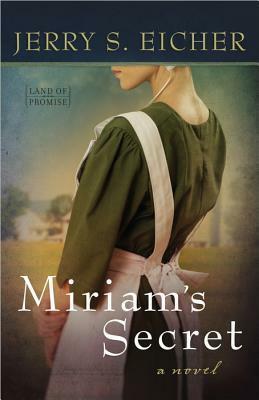 Miriam’s Secret is the first book in Jerry’s NEW Land of Promise series. Jerry Eicher has begun another wonderful, true to life Amish series! When the man Miriam is hired to care for dies, she is surprised to learn that she has inherited a huge fortune, along with his family farm. Having grown up in an Amish home and teaching in Amish schoolhouses, Jerry Eicher knows very well the ways of an Amish community. This is such a unique situation – I can’t imagine this happens often to young Amish girls. I don’t want to give anything away, so I’m going to tread lightly here… but it’s a great story! From the first word, this story will draw you in – and it won’t let you go until the last page. Whether it is the superb writing or the wonderful plot, you will find this book impossible to put down… and if you’re like me, you’ll be wishing the second book was available the moment you finish the first book! Don’t miss this wonderful new series – the Land of Promise! Bestselling author Jerry S. Eicher (more than 600,000 books sold) brings new characters and surprising challenges to lovers of Amish fiction in the Land of Promise series. In this first book, Miriam Yoder has a secret. Her compassionate care for Amos Bland during his last days resulted in her receiving a large inheritance. When Ivan Mast indicates his intentions at romance, Miriam suspects he’s discovered her hidden wealth and has plans that aren’t inspired by his love for her. Seeking a fresh start where no one knows her, Miriam accepts a teaching position in faraway Oklahoma where she meets Wayne Yutzy, a local greenhouse employee. His interest in her seems genuine and when he proposes, Miriam accepts. Happiness surely awaits the newly engaged couple….or does it? Disclaimer: I received a copy of this book free in exchange for an honest review.